Hot diggity dog! We have taken a good old hot dog to the next level by combining it with a BLT. Bacon makes everything better right! #JustDelicious BLT Hot Dogs. Mix the mayonnaise, capers and gherkins in a small bowl and set aside. Prepare the tomatoes, lettuce and basil and set aside. Heat the olive oil in a pan and fry the bacon until slightly crispy, remove from the pan and set aside. In the same pan, fry the American Gourmet Hotdogs until heated through, remove from the pan and set aside. In a clean pan, lightly toast the buns. Remove from the pan, butter and set aside. Add the mayonnaise mixture to the prepared lettuce and basil and toss to coat well. 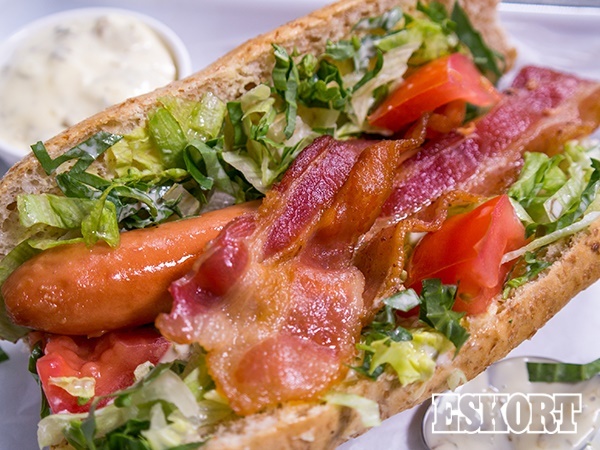 Assemble your BLT hot dogs with a layer of the lettuce and basil mixture, an American Gourmet hotdog sausage and top with the tomatoes and bacon. Serve immediately.